Getty ImagesNetflix will report quarter ely results after Tuesday’s closing bell, kicking off the internet earnings season. Netflix will report its third-quarter results after Tuesday’s closing bell. Shares have fallen more than 20% since peaking in June and were punished particularly hard during last Wednesday’s aggressive market sell-off. Several analysts have slashed their price target ahead of the earnings. Netflix is set to report its third-quarter earnings after Tuesday’s closing bell, and investors on Robinhood, a no-fee trading app popular among younger traders, are buying the stock’s dip ahead of the results. The streaming-video giant faced a huge selling Wednesday, when the broader market witnessed its heaviest selling in nine months. Among the FAANG stocks, Netflix was the biggest loser on a percentage basis, with shares declining by 8% that day and seeing $US13 billion wiped out from its market value. While shares have rebounded a bit from last week’s sell-off, they are still down more than 20% from their record high of $US423.21 high set in June. And millennial investors have been buying the shares following last week’s slide. According to Robinhood data tracked by Business Insider, a total of 2,035 users have added Netflix shares since last Thursday. More than 108,000 Robinhood investors currently hold the stock, making it the 12th most-popular stock on the app. When Netflix’s results are released after the bell on Tuesday, traders will be paying close attention to the number of new subscribers. Last quarter, Netflix added 5.2 million new subscribers – 1.1 million in the US and 4.1 million internationally – missing Wall Street expectations for the first time in more than a year. The streaming giant also warned investors that its subscribers would fall short of estimates in the third quarter. 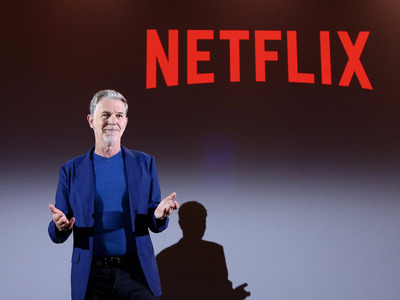 Netflix is expected to earn an adjusted $US0.81 a share on revenue of $US4 billion, according to analysts surveyed by Bloomberg. They are also expecting domestic subscriber net additions of 600,000, and international subscriber net additions of 4.2 million. And in a note sent out to clients on Tuesday, Morgan Stanley trimmed its price target for the streaming giant to $US450 from $US480 – still 35% above its Monday’s closing price – citing the impact of the stronger US dollar and higher long-term marketing spend. That note came out one day after Goldman Sachs slashed its price target to $US430 from $US470, citing an anticipated cut to 4th quarter guidance. 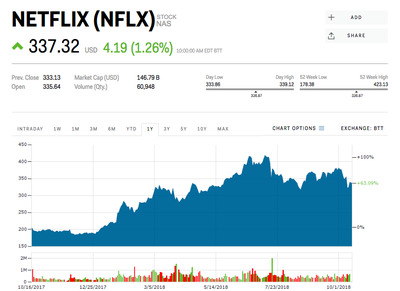 Netflix has gained 63% this year through Monday.